This beautiful jewellery box from the Swiss maker Reuge is fitted with a 36 note musical movement which offers a fantastic depth of tone. The music box is wound from underneath. When you lift the lid the music plays. 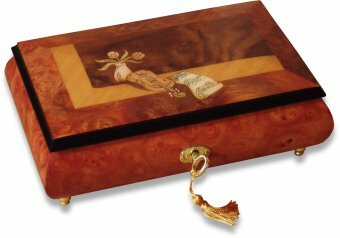 The box is inlaid with a violin and roses design. 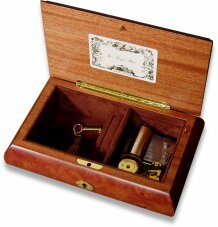 This musical jewellery box is finished with a satin lacquer and is fitted with a lock.